A.C. Lighting Inc., distributor of world-class lighting, rigging and video technologies is pleased to add Follow-Me’s hardware solutions to our product portfolio. Follow-Me has recently introduced the new Follow-Me Mouse console and the new Fader Console, both which enable users direct tactile control of the Follow-Me remote follow spot control system. The Mouse Console provides an ergonomic handle for prolonged usage and proportional control for smooth and accurate targeting. It is PoE connected. It has tow encoders and buttons that can easily be mapped to fixtures or target parameters. 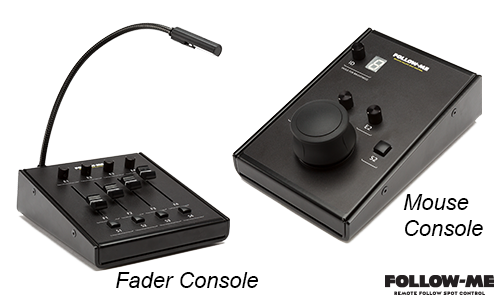 The Fader Console provides an additional 4 faders, encoders and buttons for fixture parameter, camera function or z-height off-set functions. It connects to the mouse via a 4pin XLR. “Follow-Me has been incredibly successful for A.C. Lighting Inc., gaining in popularity in the North American markets. The system has provided a unique product option for Remote Follow-Spot Control. I am pleased to see the company grow and provide new hardware to make the system even more responsive.” remarked Fred Mikeska, Vice President, Sales. A.C. Lighting Inc. introduced Follow-Me to their brand portfolio a year ago, and the company has since grown to include the Follow-Me Lite Software option and now the Mouse and Fader Console solutions. Stop by A.C. Lighting Inc.’s booth 951 / 1051 at LDI (October 19-21, 2018 in the Las Vegas convention center) to learn more about Follow-Me, and have a demo of this incredibly popular and unique product line.